Yippee! I’m on the Book Sale Trail. What does that mean? I’m trying to find an audience for my writing and believe me, it isn’t easy. Not for me, and not for any writer who has not been on the best seller list. . . yet. There is a long period of time between getting a book published – and another book published – and another, and being known as a writer. It is a long, hard trail. For those who are celebrities who suddenly decide to write a book, it is easy. People already know you and they are curious about what you will write about. But take me, for instance. Nobody knows me. and I don’t particularly want to be a celebrity. I am not seeking fame and fortune. I am a writer. That means I HAVE to write, sort of like I have to breathe. What I am doing is contacting book stores about carrying my book (probably they will do that on consignment, which means that I supply the books and then get a percentage (60 to 75%) of the sale price of the book.) That doesn’t amount to much. It barely pays me back for buying the book in the first place. Like I said, I’m not in it for the money. I’m also talking to book sellers about doing a book signing in their store. Again, I supply the books and they get a percentage for letting me present my work to their customers. So, because Ant Dens is set in Las Vegas, New Mexico, that’s where I was yesterday! I talked with Judy, the nice manager at Tome on the Range (a book store in Las Vegas, and also in Santa Fe) and to Jennie at the Historic Preservation Society. I also talked to a person at the Las Vegas Optic, the local newspaper. And I drove out to Fort Union National Monument to see if they might be interested in carrying the book in their small fiction section. I left each one of them a free copy of the book. It was a beautiful day, the temp hovering in the fifties, blue sky and fresh, clean air. A view of snow-topped mountains and a drive through evergreens and pinons between Santa Fe and Las Vegas. The bonus is that it was time well spent. Eventually, my book will be in their stores and I’ll do book signings in the spring, most likely. But that’s the way it always works. There is no such thing as an ‘overnight’ success in publishing or any other work arena. Luck is not luck, but preparation combined with opportunity. And we MAKE our own opportunities. That’s it for today. Tomorrow, I’m off on the Book Sale Trail in another place. 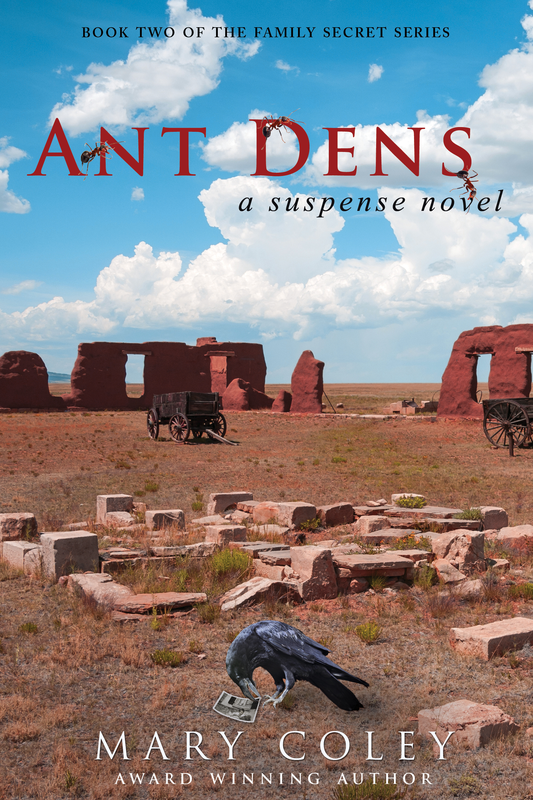 Check out Ant Dens: A Suspense Novel, now available at some independent booksellers, as well as online booksellers (amazon, barnes and noble, books a million) and soon in ebook formats, too! And come back for my next post, when I’ll be telling you all about this year’s Tony Hillerman Writer’s Conference in Santa Fe! Mary Coley, I understand that writing is not about the money; I have eight or nine books listed on Amazon and they are the ones who make the money! I wish you success with your books; good luck too even though you do not think it counts for much!